Everyone loves a clean kitchen and that’s exactly how it should be if you spend most of your day dishing out one meal after another. Apart from de-cluttering and organizing, cleaning the kitchen also requires that you have your biggest kitchen cleaning tool in good shape. Kitchen sinks are the most important section of your kitchen when it comes to cleaning not just the dishes and utensils but also carrying most of water cleansing tasks like washing vegetables, fruits, cleaning kitchen napkins or simply mopping the worktop or island tops. Stainless steel kitchen sinks come in a wide variety and type. Undermount stainless steel kitchen sinks are very much in demand these days due to their low and sleek look as they are fitted and pressed to the bottom of the counter. Undermount kitchen sinks are available in different materials like stainless steel, concrete, acrylic, natural stone, copper, bronze, cast iron and fireclay etc. However, undermount stainless steel kitchen sinks have gained popularity over others for their ease of use, maintenance and durability. The look is cleaner and consistent and they are quite affordable. However, dried water spots and mineral spots may show unless it is wiped dry after use, but it is much better than natural stone or concrete sinks which are prone to cracks, breakage etc. Drop-in stainless steel kitchen sinks are an easy and convenient way to give a new look to your kitchen and at the same time experiment with your sink. While purchasing a drop-in stainless steel kitchen sink, keep exact dimensions of the hole in the countertop. A drop-in stainless steel kitchen sink installation requires sink clips to secure it into the countertop and most of sinks come with clips. Step-by-step installation of drop-in stainless steel kitchen sinks is readily available on the Internet or you could contact the local kitchen hardware shop. If you are not comfortable or confident of installing your drop-in stainless steel kitchen sink yourself, you can always consider having the contractor install it for you. Stainless steel kitchen sinks are available in single or double bowl. While large kitchens with good space can afford double kitchen sinks, smaller kitchens regularly face a space crisis and should therefore be fitted with single bowl stainless steel kitchen sinks. They are available in various dimensions to suit not just the space crunch but also to make it easier to accommodate the daily load within the available space. Undermount single bowl stainless steel kitchen sinks are available in square, rectangular, round and oval shapes. A good depth would ensure optimized usage of space and cater to cleaning work efficiently. With large kitchen comes the onus of more cleaning as cooking process spans over different platforms in the kitchen. And in case you have a big family, then everyday load of utensils and dishes calls for an organized and heavy cleaning process. Double bowl stainless steel kitchen sinks are a boon for such situations. While one of the bowls can be used for dumping used dishes and utensils, the other is still available for cleaning, filling water or simply stacking washed utensils till they dry out. Ensure that you measure countertop properly while selecting a double bowl stainless steel kitchen sink. Stainless steel corner kitchen sinks are a great way to optimize space in the corner. Firstly, accessing the corner cabinet is always a problem, so installing a sink at the corner greatly reduces your effort in accessing cleaning tools and liquids kept below. Secondly it also utilizes space efficiently in case of small kitchens. And thirdly it allows better stacking of cleansed items to the desired platform (you may wash the utensils and stack them on the left platform while keeping washed veggies etc. on the right platform, nearer to your cook-top). Stainless steel sink gauge is an aspect that you need to know before buying a sink for your kitchen. It is the thickness of the steel used in making the sink. They are numbered from 22 to 16 or 15. The lower the number, the thicker is the steel used. 18 or lower number is good enough to be durable and long lasting. Despite this fact, you may want to consider the price difference amongst the various gauge numbers. So make an optimal choice of stainless steel sink gauge and price while selecting. Selecting a sink that suits your needs requires a thorough understanding of the various features and innovative styles available in the market. 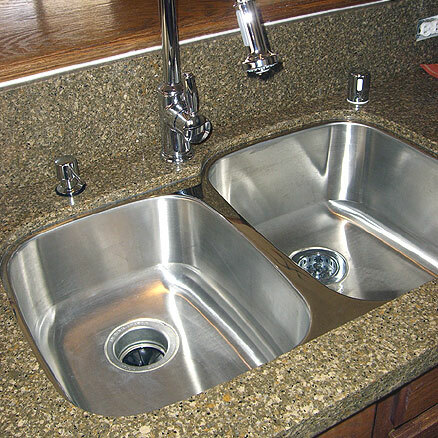 Stainless steel kitchen sink manufacturers may have different quality and types available. You can research the brands, quality, type and prices on the Internet before purchasing one. Among the well-known manufacturers of stainless steel kitchen sinks are Kohler, Franke, Blanco and Elkay. Stainless Steel is a great choice for any kitchen, but most people don’t know what is available. Awesome ideas here!